“Don’t go,” she whispers throatily into his ear as she hugs him. With tha t simple gesture, Marlene Dietrich, as Amy Jolly in Morocco, ascended the heights of expressive romantic longing that only she could attain. It was her first English-language film and her command of English was very limited, but as directed by Josef von Sternberg, she could already express the enigmatic mystery of womanhood like noone else. A legend was born. Von Sternberg had debuted in 1925 with his first feature film, the low-budget The Salvation Hunters, and had catapulted to fame two years later with Underworld. This was followed in the next few years with a string of additional silent-movie successes: The Last Command, The Dragnet, The Docks of New York, and Thunderbolt. From the very beginning, his films were notable for their atmospheric and artistically sculpted cinematography, which established uniquely moody, expressionistic worlds in which the stories unfold. But by that time sound films were already appearing, and in 1929, von Sternberg went abroad to shoot the first German sound picture, The Blue Angel (Der Blaue Engel) , with his Last Command star, Emil Jannings. For this new film, he chose for his female lead, Marlene Dietrich, 29 and a veteran of twenty German films, but unknown in the United States. Upon returning to the US, he brought Dietrich with him and immediately made Morocco, with her as the star, followed the next year by Dishonored. Since Morocco was actually released to the public prior to The Blue Angel, it provided the first opportunity to see a von Sternberg sound film and introduced Dietrich to American movie audiences. Certainly von Sternberg was one of the most romantic of all directors, and Morocco may have been his most extreme representation thereof. The story has a dreamlike, moody nature, and as is sometimes the case with films noir, requires a significant suspension of disbelief on the part of the viewer in order to be appreciated. One should watch the film more as a romantic fable, or a medieval romance, than as a realistic account. Indeed, the stylised gestures of the characters, the delirious passions, and the romantic visual motifs in Morocco suggest the aesthetics of ballet, rather than those typical of the “photographic reality” of cinema. The story is pretty simple. Amy Jolly, a French cabaret singer, has come to Moroccan port town Mogador to forget her past. Soon she is courted by both a wealthy French aristocrat, Le Bessiere (played by Adolphe Menjou), and an American member of the French Foreign Legion, Tom Brown (played by Gary Cooper). Le Bessiere is a sophisticated and chivalrous gen tleman; while Brown is a rugged, lower-class hunk who boasts of his attractiveness to women. Amy is romantically (and sexually) attracted to the virile Legionnaire, but Brown clings to his independence and tries to resist the mutual attraction. Eventually Brown’s regiment is sent off on a distant patrol to the east, and Amy amorously urges him not to go. Brown first agrees, but then changes his mind and leaves. Amy, feeling abandoned, succumbs to the courtly charms of Le Bessiere and agrees to his marriage proposal. When she hears that Brown has been wounded, however, her true feelings erupt, and she breaks off her engagement and rushes off to the remote eastern town to see Brown. When she arrives, she learns that he had only faked his injury and discovers him in a bar with a local woman sitting on his lap. Brown really does love Jolly, but he is jealous of the wealthy Le Bessiere and tries to maintain his manly cool. So he leaves her in the bar, simply suggesting that she might see him off when his regiment departs the next day at dawn. The next morning she does come to see him off, and as his troop marches out of town, she succumbs to her passionate feelings of love and impulsively joins the pack of soldiers’ concubines who trail after the regiment marching off into the desert. This is an act of absolute and unconditional submission to love, a theme that runs through many of von Sternberg’s films. There are a number of memorable moments and scenes in Morocco. Throughout, the film is graced by the fantastic cinematography of the legendary Lee Garmes. Using the nitrate film of his day that supported a greater contrast range than film stocks of today, Garmes and von Sternberg present atmospheric images of light and shade, using various image-sculpting artefacts. For interior scenes there is often light coming through Venetian blinds into a darkened room. For exterior scenes, shady streets are illuminated by streaks of light that shine through palm tree leaves or roof slats. 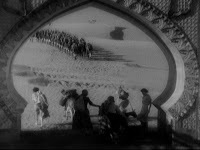 The opening scene shows the Legionnaire regiment marching into the port town of Mogador (Essaouira, today). The drumbeat sound of the marching soldiers will prove to be a leitmotif of fate for the remainder of the film. This is followed by the Moslem call to prayers and the sight of city dwellers kneeling down en masse to pray. In a short space of time, the atmospheric backdrop of the environment is beautifully presented. Le Bessiere (Menjou) is the ultimate gallant and civilized gentleman, ready to do anything for Jolly, but always discretely refraining from forcing his evident affection. Brown, by contrast, is awkward, but confident and very physical. Von Sternberg emphasised Cooper’s 6'3" frame by having him a bit too tall for the door frames in the buildings, necessitating him to duck his head on entry and entrance. Fifty minutes into the film, Brown goes to Jolly’s dressing room and finds her with Le Bessiere, where he overhears Le Bessiere’s, initially unsuccessful, marriage proposal. After Le Bessiere leaves, Brown and Jolly engage in a dramatic and romantic conversation, capped off with a passionate kiss. 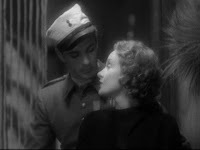 This is their closest moment in the film, and the chemistry between Dietrich and Cooper is palpable. But the scene ends with Brown’s impulsive, seemingly capricious, decision to leave her and rejoin his regiment. There is then a long, slow atmospheric tracking shot running through the lengths of the regiment, showing all the soldiers kissing their local girl friends. Abandoned by Brown, Jolly accepts Le Bessiere’s offer of marriage, and there is a memorable engagement banquet scene. During the dinner, Jolly hears the drumbeat of Brown’s returning regiment and stands up in alarm, accidentally breaking and scattering the pearl necklace she had received from Le Bessiere. She rushes out into the street to find out what happened to Brown. This symbolically signalled event was inevitable in this narrative. The passionate and alluring Dietrich (Jolly) could never be content with the civilized life offered by Le Bessiere. Again there is a lengthy back-and-forth tracking shot down the length of the regiment as Jolly desperately searches for news about Brown. The ensuing piano bar scene, with its seductive piano melody in the background as Jolly discovers Brown with another woman, is also unforgettable. After his departure, her final, lone discovery of her own name carved into the wooden tabletop is memorable for others, too: I have seen the words, “Amy Jolly” carved into wooden table tops in other bars around the world. Morocco received four Oscar nominations, including Best Director (von Sternberg), Best Actress (Dietrich), and Best Cinematography (Garmes). In the end, what we have is von Sternberg’s haunting imagery of romanticism. For him love requires unconditional surrender. If one loves truly, one must love without any promises of faithfulness, of returned love, or of anything in return. One must submit totally – a stark sentiment even more dramatically felt in its exotic setting. Dietrich got an Oscar nomination for this? I mean . . . she gave a decent performance, but a nomination?